Count Dracula and his family have just moved into the haunted mansion and are looking to earn some down payments on their mortgage by playing this brilliant online slot game. This vampire affair is a pretty standard game with 5 reels and 15 paylines. 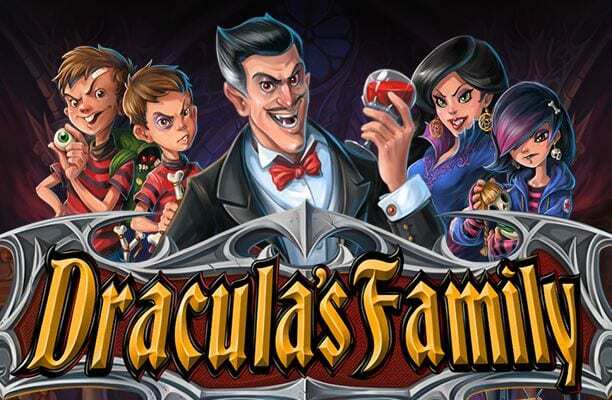 The character Bram Stoker created all those years ago has been immortalised in an online slot game where you must match symbols of Dracula, ghouls, and gravestones to amount a significant proportion of free spins and cash prizes. All right here at Wizard slot games. Playson is an up and coming Software Company. This Malta based company brings a freshness and boldness to the online gaming industry, and their games are full of technological innovation and thematic creativity. Have a great time when you play our new list of slot games today. Written by Bram Stoker in 1897, since then Count Dracula tale has become infamous in history, he is not your typical Prince Charming, nor has he ever been associated with the ‘knight in shining armour’ cast. Cunning like a snake, and with a bold personality, Dracula will transfix you to your seats as you play this deadly reel game. Playson has given this Victorian novel a modern twist by putting it through a classic online slot game of 5 reels and 15 paylines. This game, one of the best UK video slot games, is fast-paced, with plenty of action to keep you entertained at every spin. The money values are set at 1p up to £3 per coin, and your maximum wager is fixed at £45 per spin. 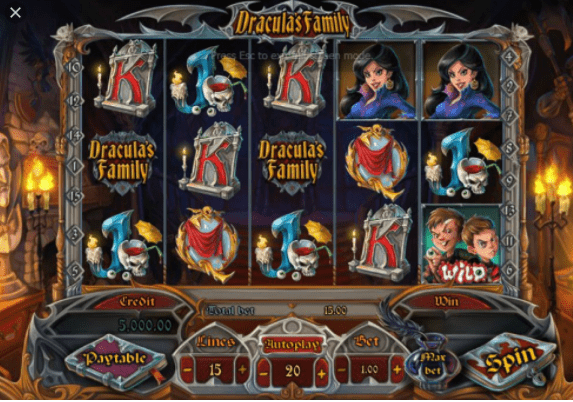 Summon the reel and meet Dracula’s terrifying family in the form of symbols for this online slot game. Your Wild Cards are the Evil Twins symbols and the Eyeball symbol, while the Scatter is the Dracula’s Family Logo. 3 Scatters will trigger the Free Spins mode, there are 4 different Free Spins features. The first Free Spins mode is only available in the Mad Multiplier mode, but you can unlock the next Free Spins mode by playing more than 3 games in the previous mode. The Gamble mode is available after every winning combination. Winning in the Gamble round doubles the winning per round. Gamble mode is available up to 10 times in a row. In this round, players need to guess which coffin is filled with gold. The Mad Multiplier feature will grant you 15 Free Spins with a 5x multiplier. If you get another 3 Scatters on the reels during this round you will activate an additional 15 Free Spins. The Eternal Love Bonus feature rewards you with 15 Free Spins which includes a Bonus symbol, you would need to get the Mom and the Dad symbols to combine them into 1 Bonus symbol. If you get 3 Scatters on the reels this will trigger 15 additional Free Spins. You also have the Wild Whistle-Heads Bonus feature which will give you 15 Free Spins, while the Super Wild Twins symbol appears only on reel 5 it will transform all symbols of 3 reels into Wilds. In this feature 3 Scatters will also trigger 15 additional Free Spins. And finally, you have the Delirious Reels Bonus Game which features 15 Free Spins and a progressive multiplier for any lucky player. When you play a winning combination, the panel shifts one reel to the right. Within each next shift during the spin, the multiplier increases by x1, x2, x4, or x7. 3 or more Scatters will activate another 15 Free Spins. Another fabulous game to try is our gonzos quest slot. Transport yourself to a devilishly spooky Transylvanian setting when playing Dracula’s Family, the graphics are wicked. But not just that, this online slot game features innovative free spins rounds that offers huge wins to many lucky players. Trust your instincts, and be like Dracula and his family, don’t follow the script, because there is a chance you could strike it big here.